The Serbian Orthodox Church celebrates the Feast of Saint Sava on January 27. It is an important religious holiday in Serbia and the Republika Srpska (one of the two entities in Bosnia and Herzegovina). 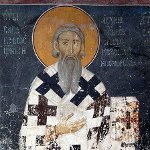 Saint Sava (born Rastko Nemanjić) was born in 1174. He was the youngest son of Stefan Nemanja, the Serbian Grand Prince. When he was young, he escaped to a monastery on Mount Athos, became a monk and received the monastic name of Sava. His father tried to convince him to return home, but did not succeed. In 1291, Sava was consecrated as the first Archbishop of Serbs. Thus the Serbian Church was given autocephaly by Patriarch Manuel I of Constantinople. In the same year Sava published Serbia's first constitution, Zakonopravilo (the Nomocanon of Saint Sava). It is still used as the highest church code of the Serbian Orthodox Church. Saint Sava is venerated as the founder of the independent Serbian Orthodox Church. His feast day falls on January 27 of the Gregorian calendar (January 14 of the Julian calendar). In 1830, Saint Sava also became the patron saint of Serbian schools and schoolchildren therefore the feast of Saint Sava is typically a day off for Serbian students. On this day, children participate in recitals in church.